Umi is a Rhino-based plug-in that analyzes a neighborhood or city's outdoor comfort, operational and embodied energy use, walkability and daylighting. Umi is developed by the Sustainable Design Lab at the Massachusetts Institute of Technology. 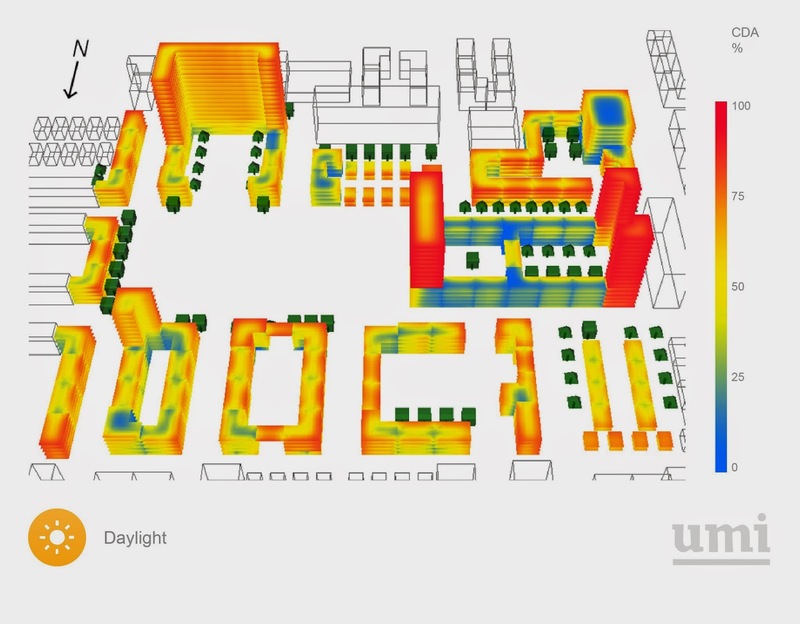 In addition to operational building energy use, walkability, and bikeability, umi can now also calculate embodied energy and floor area ratios (FAR). Operational energy simulations use the EnergyPlus-based “shoeboxer” algorithm as presented by Dogan at SimBuild 2013. Non-geometric building simulation assumptions are stored in a new template format as presented by Cerezo at SimBuild 2014. Umi projects are now stored in a single *.umi file which contains the Rhino scene file, the epw weather file, building modeling templates as well as all simulation results. You can export any of this data to use it separately. A new results viewer allows users to analyze and export simulation results as well as import results generated from third party simulation environments. Selected umi projects can be found on the new umiverse site. Take umi for a spin. 2.0 is significantly different from 1.0 so we encourage you to consult the updated user guide as well as a series of video tutorials.